This year, Victoria School celebrates its 135th year. We have come a long way. This is a joyous occasion and we invite all in the Victoria community to celebrate with us. We will launch a series of events including the much anticipated Victoria Challenge, the 135th Anniversary and Speech Day as well as the 135 Dinner. 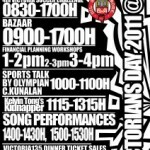 To kick off, Victorians’ Day will be back on 5th March 2011. Do come back to visit your alma mater. Please contact us if you wish to contribute to the Victoria Heritage Centre. Is there a way to view the school magazines in a magnified way? The text are too small. The text are big enough to be read now. Thanks! The hours of opening for the Victorians Day on March 5? 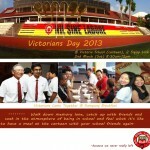 Victorians' Day on the 5th March will be a full day event 9am – 5pm. It's a good opportunity to renew your ties with VS and VJ. See you there! Wonder why a number of The Victorian year magazines are missing at the heritage site. They are actually available at the National Library. I guess they are still in the pipeline. Indeed, National Lib does have a private stash of our copies; only year book I guess. VS's effort this time encompasses periodicals as well.